It's been quite some time since I participated in a bloghop around these parts (unless you count the Insecure Writers Support Group), but this one seemed right up my alley, so I thought I'd join in the fun. 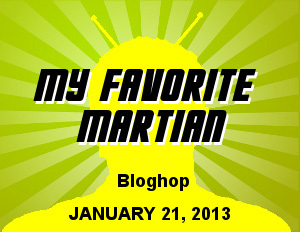 Hosted by The Geek Twins, the My Favorite Martian bloghop asks its participants to delve deep into the collective mind of the science fiction genre, grasping across literature, film, comic books, video games, or any other medium home to alien reverie. Thus, I am tasked with the practically inconceivable burden of choosing one alien character from the entire genre that I feel embodies the awesomeness it has on offer. Worse yet, the alien being of my choosing does not actually have to be a Martian. This widens my pool of characters to choose from considerably. I mean, the Star Trek universe alone contains something like four hundred (!) different species of alien life. How am I ever going to choose one race, let alone one character within that race, from all of science fiction as my favorite alien? Impossible, I say! It cannot be done! And yet, I must. Toward which corner of the multiverse should I cast my gaze? We've already mentioned the wide selection that Star Trek has on offer, and I am definitely a fan of Gene Roddenberry's universe. Who doesn't love Mr. Spock, after all? He's more than just a pointy-eared space elf; he's a walking battlefield. Beneath his cool exterior, his human and Vulcan halves are constantly at war with each other, an endless struggle between logic and emotion. If that's not fascinating, what is? Then again, that might actually be a good reason not to choose our favorite Vulcan science officer for this entry, as I'm sure someone else will. So who else among the Trekian droves? Klingons are an interesting species, if not a little Orcish. The "proud warrior race" thing has grown a little stale these days, but our Klingon friends were one of the early archetype examples, so they get a perpetual pass, in my book. And then you have Lt. Worf, who has his own duality conflict going on, having been raised by puny humans. But you know, he's just not doing it for me today either—afraid not, Mr. Worf. Your mating rituals intimidate me. Damn you for being human, Picard! You'd have made this so much easier if you'd had a rubber forehead like the rest of the cast. I'm afraid I must turn my search to another universe. The next obvious choice would have to be Star Wars then, wouldn't it? Like our previous candidate, Lucas's universe comes ready-made with hundreds of alien species to choose from. And having rejected Trek, it's only right that I give the galaxy far, far away equal consideration, since they've been at each other's throats for decades. Can the rebel forces sway my heart in their battle against the Sith? As diverse as the Star Wars cast of aliens is (technically every character is an alien, even the humans), there's really only a couple of characters that spring immediately to mind as worthy candidates for this bloghop. The first would have to be Yoda. I'm pretty sure this Jedi Master was responsible for the entire development of my moral compass as a child. But alas, I'm afraid he suffers from the same problem that keeps Spock from taking it home. You're just too popular, little guy. Then you have my next favorite alien in the Star Wars universe, Chewbacca, whose Wookie language I make a point in practicing every morning as I get out of bed. He, too, comes dangerously close to "obvious choice" territory though. And on top of that, as cool as it would be to have a giant man-bear-dog-thing in your company, a large part of Chewy's appeal is dependent on his proximity to Han Solo. Take his scoundrel buddy status away, and he's just a speck of fluff amidst a sea of furballs. I'm running out of options here, not to mention reaching the upper limits of my length threshold on this blog, and still I've yet to choose my favorite alien! If the overpopulated galaxies of Star Trek and Star Wars don't yield results, where can I turn? Alien? Stargate? The Thing? Mass Effect? Argh! That's it, I can tarry no longer. There has to be an alien out there that represents a worthy pinnacle of awesomeness—one alien character who outshines all the rest in every way. I must choose! The answer is just outside my grasp. Yes! I can feel it! I can't believe it took me so long. Has a more tragic, compelling character ever been written? May we all aspire to such greatness. My first choice was going to be Seven of Nine, but she's human as well. Bummer. Surely there must be a Borg loophole in there somewhere? Then again, if there was, I could have used it for Picard, AKA Locutus. This sounds like a really awesome blog hop (goes to take a peek). Thanks for stopping by, Vero! oh... my! I love that pizza guy and my comment rhymed! You're a poet and you didn't know it? It's one of my favorite movies of all time! I try to give it a rewatch every couple of years or so. ROFL!!!! So far this is best one I have seen! All I can say is that at least you picked a spoof Star Wars character and one of the best ones at that! May the schwartz be with you! You know, every time I read "May the schwartz be with you," I can't help but hear it in the Yogurt doll's squeaky voice. I wonder if you can buy those things somewhere? Thanks for stopping by, Teresa! LOL A brilliant and surprising choice! Pizza the Hut was very funny J.W.. Thanks for joining! It was great fun, Maurice. Thanks for hosting it! He is delicious. Thanks for reading, Liesel! Too funny! I did love your process of elimination though. Spaceballs is absolutely one of the best- and easily funniest- space adventure stories of all time. Bill Pullman is my favorite actor largely because of that movie (Independence Day is the other reason). If you haven't seen this Mel Brooks masterpiece, rectify that RIGHT NOW! Totally agreed, Shaun! I miss Mel's brand of humor. It's too bad he's not ruling the box office anymore. OMG, I love Spaceballs! I've seen the film 15 times at least. Awesome pick, and thanks for bringing back childhood memories. You're welcome, George! I couldn't tell you how many times I've seen this movie. A ridiculous amount, I'm sure. Ha! That was a really great read. After following what you had to say, I thought you was going to choose E.T. or someone. But no. You're a loon like me. Pizza The Hut -- voiced by Dom DeLuis -- the only actor to star with both his children in Stargate -- won the day. That remind's me. I've got to review Spaceballs one of these days. It's a good film. I think Mel Brooks made a career off loons like us, Jay. Thanks for stopping by! lol Spaceballs is a great movie. There are so many great aliens to choose from. Agreed on both counts, M Pax. Thanks for reading! Brilliant (and original) choice! Love Spaceballs. I had to go with E.T. for my choice, but this is hilarious! Thanks very much, Todd! E.T. is a great choice, too. What a long, strange trip that was! I watches Spaceballs once, but I can't remember that character, or much of the movie, I have to admit. Well, you must rewatch it then! It's a classic. Thanks for reading! Good choice, ultimately! And delicious! Well done! I hadn't even thought to go there. This blog hop was so awesome. I have had a great time reading everyone's choices. "He ate himself to death!" Much agree, Jessica. It's been great fun. Thanks for stopping by! Ahh, Space Balls, what an awesome film. My favorite part was when the little alien popped out of the guy's chest (not again!) and danced across the diner counter top like the frog from Looney Tunes. Need to rewatch that one. That might be my favorite scene of the movie. The fact that they actually were able to get John Hurt for that scene was fantastic. Thanks for reading, Siobhan! Hey JW! Thanks for the comment! Hope all is well with you, too, man! And HELL TO THE YEAH! Pizza the Hut has to be one of the best aliens---ne, characters---ever thought up. He's just a big lump of genius satire. I watched this movie religiously when I was a kid. I was probably way too young for most of the jokes, but luckily they went right over my head. I recently watched it again as an adult and thought, "How stinking cow, mom, what were you doing letting me watch this when I was five? I see your schwartz is as big as mine!?" I digress. Awesome choice here, JW--further evidence that you're the man! I must admit, my parents didn't seem to care what I watched at all. I cringe when I think back to the movies they let me see. I only realized that was strange when friends at school would ask my favorite movies and then their eyes would widen as I rattled off R-rated films they weren't allowed to watch. Thankfully, it didn't corrupt me beyond repair! Thanks for stopping by, Randi! Anyway, I was wondering who you were going to pick! Can't believe you gave up on Spock so quickly! Worse, it's the scene from Spaceballs where we are introduced to Pizza the Hut! Spock is certainly one of my favorites of all time, but I didn't want to go with the obvious choice. Thanks for reading, Diane! Very funny! Loved the tribute to many characters! Oh gosh, Pizza is so putrid. XD I absolutely loved your process to the big reveal. I know what you mean; I had it in my head pretty much the whole time I was writing this. Thanks for reading! OH MY GOD! I can't believe I forgot Pizza the Hut!!! !